Keely had promised me that she had a fabulous cheesecake recipe for me and that it not only contained chocolate but also CHILLI. That’s pretty immense already. The flavours are possibly better than the idea. I personally would probably like a little more chilli kick, but this has a lovely zingy aftertaste which brings it up a few notches. Also, it should have a beautifully marbled effect but I think I had too much chocolate and not enough mascarpone/cream mixture (I had to halve the quantities thanks to a lack of mascarpone). Anyway. You should make this. It is YUM. Thanks for the recipe, Keels! 1. Place the ginger nut biscuits into a plastic bag and, using a rolling pin or similar crushing device, crush into crumbs. You could also carry around the biscuits in your bag for a week and you’d probably end up with the same result, but this is probably quicker. 2. Add the dried chilli flakes and give the bag a good shake to combine. 3. Add the melted butter to the crushed ginger nuts. Empty into a greased 9″ cake tin and place in fridge to set. 4. Scoop the mascarpone cheese into a large mixing bowl, and use a whisk. 5. Meanwhile, in a separate, smaller, bowl, add the double cream, a little at a time, to the icing sugar, whisking all the while, to avoid lumps. 6. Add the cream & icing sugar mixture and the orange juice into the mascarpone and combine with the whisk. 7. In a heatproof bowl over a pan of boiling water, gently melt the chocolate. Once liquid, stir the chocolate into the cheesecake mix. Do this sparingly, it creates a nice marbled effect. 8. Take the base out of the fridge and pour the cheesecake mix over it. Using a palate knife or spoon (or fingers if you’re feeling lazy) smooth the surface. If there is any chocolate left in the glass bowl, use a teaspoon to drizzle it over the cheesecake. 9. Cover and place back into the fridge for at least an hour to set properly. 10. To serve, use a sharp knife and cut through the cheesecake, then plate up. Or dig a spoon straight in and gobble the whole thing down. Om-nom-nom. Hope you enjoyed! Until next time, peace and love. 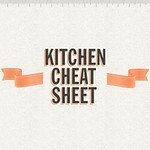 I love adding chili to chocolate recipes…it makes such a difference. This looks like a rich and creamy dessert that would please almost anyone! This is positively heavenly! Love that there is mascarpone and a ginger crust with the spice – scrumptious! 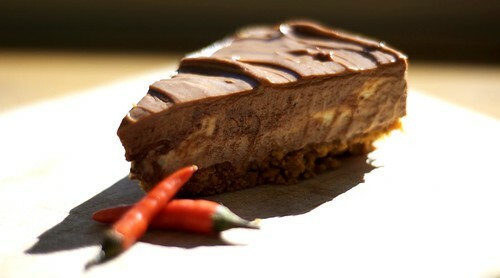 Monet – I've always loved chilli hot chocolate but never thought about having it in a cheesecake before! This was super delicious – Momma Lee loved it, she even sprinkled some extra cayenne pepper on top! She brought some over to Brother and his flatmate too and as far as I know they gobbled it up! Cinnamon-Girl – thanks for dropping by! I definitely recommend this recipe – it was super delicious. The only thing I'd change is adding more chilli!